Thank You, Hennepin Tech Volunteers! This article by Brenda Harvieux will appear in the September/October 2018 issue of Northern Gardener. You can view the garden on the southwest corner of the Agriculture/Horticulture Building at the Minnesota State Fair. The Hennepin Technical College Landscape Horticulture Department has long supported MSHS’ Minnesota Green program through plant donations after its spring plant sale. “We couldn’t fund the development of cirricula and be as generous in the community without the funds from the plant sale,” says Deb Kvamme, who teaches in the Hennepin Tech program. Volunteers from Hennepin Tech spruced up the MSHS garden in time for the Minnesota State Fair. For her professional gardening class, students assist with community gardening projects. This year, they are helping us with the MSHS Adopt-a-Garden outside the Agriculture/Horticulture building on the Minnesota State Fairgrounds. In this first year, Deb had to determine what students could realistically cover. First, she wanted to focus on curb appeal. Then it came to “quick-and-dirty weeding” and applying mulch. The students started with the garden planters on the corner of Judson Avenue and Underwood Street, the apple tree garden and the hell-strip garden. 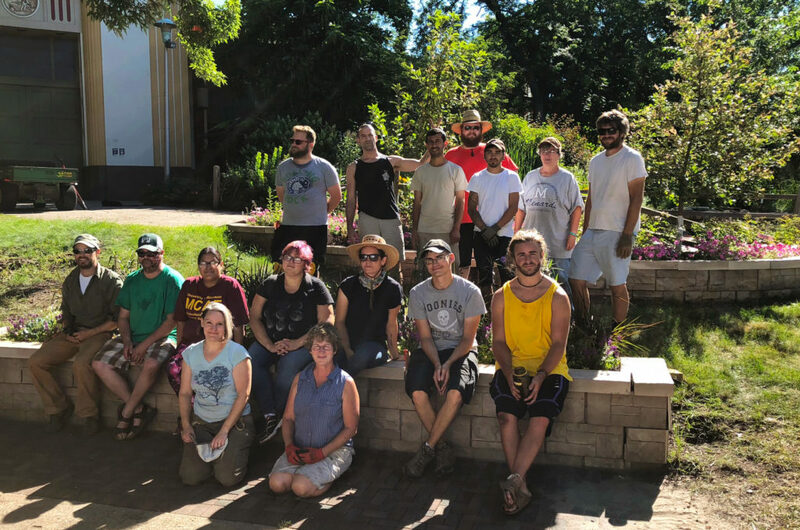 Hennepin Tech takes care of two other gardens on the fairgrounds: a native garden in the corridor by the Star Tribune booth and the gardens that used to be managed by the Minnesota Nursery and Landscape Association, also outside the horticulture building. “Actual experience working on gardening projects is a great opportunity for students to determine if they like the gardening aspect of horticulture and to ensure they are successful in the industry,” says Deb. “But they also have to know that it’s not all about money. It’s important to volunteer, meet people and be a part of the community.” MSHS is grateful for Hennepin Tech’s support with our garden, and we’re thrilled the project helps students grow as horticulturists and community members.